I think I need to start doing a 40/60 dual wave - the MEF backlash always happens because I tank shortly after eating my meal...and then have to chug some juice and stop my square 3-hour delivery for fear of killing myself. Right around midnight I start to pay for my error. And then, of course, I aggressively correct that sucker upon waking and end up low on the subway. This may sound crazy. Okay I know it's crazy. But I was determined to figure out Chinese food and pizza for Caleb so I would chart it out every time he had them. 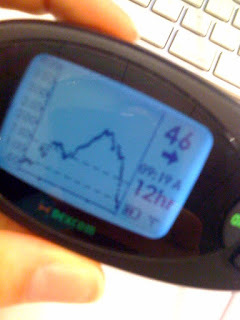 I would bolus and check his bg every hour or two after and map out where he needed more or less insulin and finally came up with a plan. It took a while, but it usually works. I keep the "dose formula" in a note on my phone bc I won't likely remember it. I hate chasing those numbers! Ellie was HIGH HIGH HIGH, we put more and more insulin in that little girl...then 1:45 in the morning I have Dexcom screaming LOW LOW LOW. Ugh! If it's not the food hiding in her with awful timing...it's the insulin hiding in her waiting for me to fall asleep! Damn D! Good luck to ya on your quest to figure out chinese food!